Many entrepreneurs and/or work from home moms and dads with children that are tweens or teens debate whether or not hiring their children to work from them is a good thing or not. As you work towards the internal debate over whether to hire your child or not, I wanted to express my thoughts and concerns, as well as some tips on hiring your child as a means to help you make the right decision for your business as well as your family. Is Hiring Your Child Right For You? Hiring your child is not only a tax benefit but it can also teach them a good work ethics — working hard for that dollar. As your child becomes a teenager you may find their needs and wants start to get a little expensive. As a parent, it can be overwhelming financially just providing the necessities for your children, not to mention those extra wants. When you hire your child you start to teach them how to manage money, how to manage time, and how much that little extra want really costs in comparison to an hourly wage. What is a reasonable level of work for the age of your child? Don’t have a 7 year old doing tasks that doesn’t fit their age group. By the same token, don’t have your 17 year old doing something the 7 year old should be doing. Provide a job description and Employee Agreement – Treat this venture as a real employment opportunity for your child. This includes providing them with a document that describes their job title and an employee agreement that lists their pay. Study what Others are Being Paid for this Job – Be sure to pay your child industry standard wages. Don’t low ball them just because they’re a family member. Research the average salary for the work your child will be doing and pay them reasonably. Do you have an LLC? – Your child working for the family business only becomes a write off when you are an actual business owner or an individual/married couple with an LLC. So hiring a child as an actual employee, only applies when you have a registered business of some sort. Hiring a child when you are a freelancer – While tax benefits may not occur, you can still hire your child to work for you as a means to teach them good work ethics without the added tax benefits an LLC or business would gain. Once your child hits the age of adulthood, that is age 18, then different rules and regulations apply. 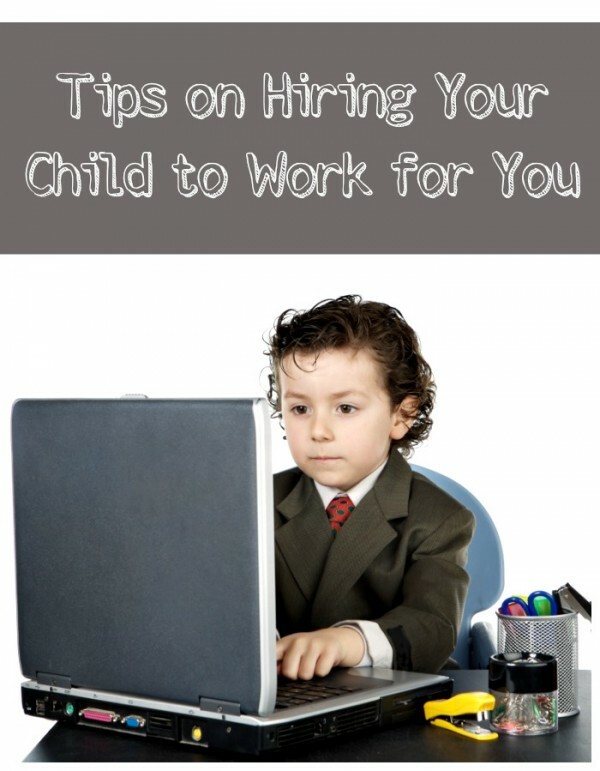 However, if you are hiring a child who can be listed as a dependent on your tax return to work for the family business then we hope that this article has provided some insight on how to properly go about hiring your child to work for you. I can tell you from experience as a work from home mom, hiring my son to work for me has been one of the best things I’ve done for my business. really cute and great ideas. kids today are so much more savvy tech wise and can do so many more things than most adults. there was something abt this on nbc yesterday with kids. i wish i could teach my dogs to help me. kids come up with different ideas than humans, so they can really add imput. I’d rather have my future children work for someone else so there is no conflict of interest. Chores don’t count as hiring someone. This is good information. I think it’s great for parents to get their children involved. It begins to teach them a good work ethic while they are young. So important! This is a very interesting idea. Thanks for sharing! I’d never considered how parents could hire their kids.